It is not uncommon for the teaching ministry of the Orthodox Church to be described variously as dogma, doctrine, or theology. These words are occasionally used interchangeably, but there are specific differences between the words. Theology is the broadest category, which refers to “the study of God” in general, based on divine revelation. Doctrine literally means “teaching,” but refers specifically to propositional teachings. Dogma originally meant “opinion,” but now is used to denote beliefs based firmly in divine revelation and taught as necessary to be believed by all Orthodox Christians. The Orthodox Church finds divine revelation in several sources, and sorts carefully through these sources of revelation to instruct the people of God. Imagine the Church’s Tradition as a symphony orchestra with Jesus Christ as the Conductor. When we hear all the sections of the orchestra playing in proper tune and with the appropriate dynamics we will rightly appreciate the melody of faith and the harmony of hope. 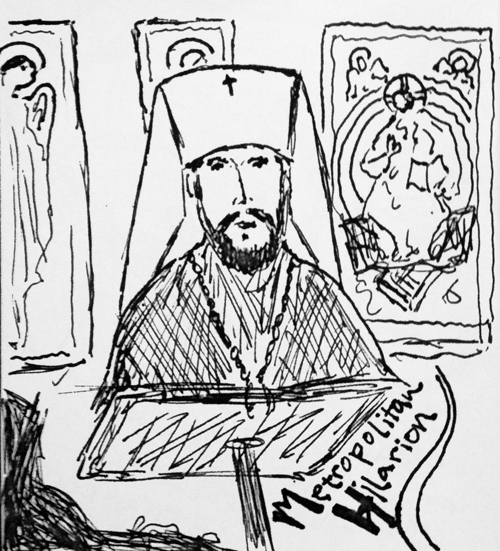 Metropolitan Hilarion Alfeyev describes theological inquiry and how we may sort through sources of Tradition to find the appropriate balance. The Holy Scriptures are an unconditional and indisputable authority. All Orthodox Christians accept the Scriptures of the Old and New Testaments as unified messengers of Christ. The Old Testament is “a herald of the New Testament,” and the New Testament saturates the Tradition of the Church. The Scriptures are essential to the motif of Tradition. Our liturgical tradition is an indispensible part of the orchestral motif of the Church’s Tradition. Liturgical texts have been refined over many centuries, led by the Holy Spirit, and are an indisputable source of teaching in our Church. We must distinguish between newer texts that have not been tested by time, and those texts which have led the Church for hundreds or thousands of years. These liturgies are a close second to Scripture. The Ecumenical Creeds and Councils of the Church rank high with the canonical liturgical texts and Scriptures. The Councils deal with incredibly difficult matters, both of a pastoral nature and a doctrinal nature, articulated in creeds and carefully worded dogmatic definitions. The dogmatic statements of the Ecumenical Councils are paramount, and the canonical guidelines—while varied in their local application—share a similar authority. The Church retains the right to return to the decision of the Councils and modify them. Doctrinal questions find further clarification in the testimony of the Church Fathers. The Church Fathers are an integral part of the symphonic harmony of the Orthodox Church. We are the heirs of the Fathers and should follow their consensus in all things. It is important to distinguish between personal opinions of the Fathers and those texts “which express general Church teaching.” Opinions that are not dogma, and are not condemned ecumenically, may be considered as personal opinions, but not pressed upon others as necessary to be believed. Other ancient “teachers” of the Church are important, in a qualified way. It is important to consider the writings of other ancient teachers of the Church, but to make a distinction between these teachers and those the Church has designated as “Fathers.” For example, Tertullian and Origen have serious problems in some of their work, but remain important influences to consider. We should also consider apocryphal literature of late antiquity, especially those pieces that have influenced the Church in some sense. Apocryphal books here, of course, not referring to those books of Scripture some have labeled as “apocrypha,” but rather to books like The Protoevangelion of James or The Gospel of Thomas. Some of these early writings ought to be rejected outright (such as Thomas), but those that are “reflected in the liturgical life or in hagiographic literature” of the Church have some standing for the Orthodox Christian. Where this literature contradicts the above received wisdom, we do not follow them. Finally, other teachers should be considered, both ancient and modern. The teaching of the Church is revealed by God and unchanging, but that doesn’t mean its articulation is static. Fresh explanations abound in different periods of history, and since the “age of the Fathers” for Orthodoxy is not limited in scope, we remain attentive to the lead of the Holy Spirit and the fresh articulation of old truths. Conclusion: Theology for the Orthodox Church is found in that beautiful symphony that is our Tradition, and only when all the sections play their appropriate parts at the right volume does the output sound appropriate. An over-emphasis on any one part of the symphony can only create discordant sounds, contrary to the appropriate execution of the piece by the great and holy Conductor, Jesus Christ. Note: All quotes taken from Archbishop Hilarion Alfeyev, Christ the Conqueror of Hell: The Descent into Hades from an Orthodox Perspective (St. Vladimir’s Seminary Press, Crestwood: 2009), 205-208. Slight modifications made to capitalization for stylistic consistency. This is a modified form of a post that previously appeared at Orthodoxy & Heterodoxy. This entry was posted in A to Z, History, Liturgical Services, Theology and tagged doctrine, dogma, ecumenical councils, hilarion, history, liturgy, theology by Jamey W. Bennett. Bookmark the permalink.